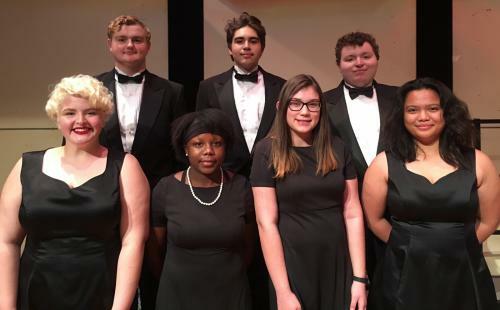 Five Paris High School students and two Paris Junior High students attended the Texas Music Educators Association All-Region Choir clinic and concert on Saturday, November 10 in Mt. Pleasant. These students had qualified for their All-Region Choir during area competitions earlier this year. The PHS students were privileged to have Lane Parks, who trained under esteemed choral conductor, Robert Shaw, as their clinician and conductor for the concert. Texas composer Laura Farnell led the junior high choir as clinician and conductor. The junior high choir performed one of Farnell’s compositions as part of the concert. PHS All-Region Choir qualifiers were Rowan Burns, Rhea Tabora, Jarod Posey, Nick Leija II, and Nicholas Reed. Paris Junior High qualifiers were Nyla Rollerson, Kayglen Shelton, and Alexis Jackson. Jackson was unable to attend the clinic and concert. The PHS Choir is directed by Jan Blize and the PJHS Choir is led by Lindsay McCarter.